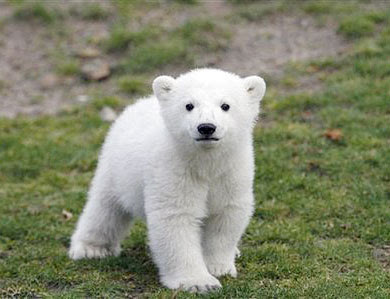 There is an interesting trademark battle possibly brewing for fans of the famed polar bear cub KNUT (pictured above). Knut was born at the Berlin Zoo in December 2006. After Knut was born, Knut’s mother rejected and abandoned the newly born cub. The Berlin Zoo had not had a polar bear cub survive past infancy in more than 30 years, so zookeepers opted to raise him. Knut’s story garnered international attention, however, after a German tabloid in March 2007 quoted an animal rights activist saying that Knut should have been killed rather than being raised like a domestic pet. This led to an outpouring of support in favor of keeping Knut alive, including a letter campaign to the Berlin Zoo and protests outside the zoo by children. 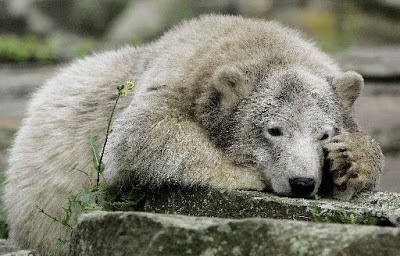 The Berlin zoo unveiled Knut to the public on March 23, 2007. That same day, the Berlin Zoo filed two German trademark applications for the mark KNUT for various goods (see Registration No. 30720102.3, registered May 29, 2007 and published June 29, 2007; and Registration No. 30720189.9, registered July 24, 2007 and published August 24, 2007) (click here for search engine to search German trademark filings). The branding of Knut led to a doubling of the Berlin Zoo’s stock on the German stock exchange. Soonafter, in the United States, an enterprising company and an individual with no apparent connection whatsoever to the Berlin Zoo decided to file federal trademark applications on the name KNUT. One application was a Section 1(b) intent-to-use application filed May 2, 2007 by an individual named Joseph Dominick Castano for the mark KNUT THE POLAR BEAR. The description of goods was the following: “Motion picture films about Knut the Polar Bear; Digital materials, namely, DVD featuring Knut the Polar Bear; Downloadable MP3 files, MP3 recordings, online discussion boards, web casts, pod casts featuring music, audio books and news broadcasts.” Not surprisingly, the U.S. Patent and Trademark Office (“PTO”) refused registration under Section 2(e)(1) on the grounds that the mark was merely descriptive: “Here, the mark ‘KNUT THE POLAR BEAR’ is descriptive of applicant’s goods because the goods presumably feature the famous Berlin Zoo polar bear, Knut.” The applicant did not respond to the office action and the application went abandoned. However, the more interesting application is the one that was filed even earlier. On April 9, 2007, a Section 1(b) intent-to-use application was filed by a California corporation named Transpo Products for the mark KNUT for “Stuffed toy bears; Teddy bears”. After being published for opposition on September 19, 2007, a notice of allowance was issued January 1, 2008. The applicant’s first specimen was rejected by the PTO because it was a catalog page advertising the Knut teddy bear (promoting the “Official U.S. Knut polar bear stuffed toy animal”), but did not show the necessary ordering information. The second specimens, submitted March 18, 2008, were two pictures of what looks like a panda bear (one with a stitched-on label reading “KNUT” and the second with a price tag that reads “KNUT”). The specimens apparently satisfied the PTO, and the mark was registered last Monday, May 13, 2008. What makes this particular registration interesting is that the Berlin Zoo, having branded the name KNUT in Germany, announced on May 1, 2007, that New York-based Turtle Pond Publications LLC (“Turtle Pond”) had acquired the world-wide publishing rights to Knut. Apparently, the deal may have been worked out a little sooner because on April 16, 2007, Turtle Pond filed with the USPTO five Section 1(b) intent-to-use trademark applications in its name directed to the KNUT mark including for prerecorded videotapes, electronic publications, motion picture films and computer games; children’s books; theme park services, motion picture productions, ongoing TV program and motion picture series and live performances; clothing; and, of course, stuffed toy animals. On July 19, 2007, Turtle Pond filed two additional applications for the KNUT mark for foods (later amended to cookies, candy, cereal, ice cream, chewing gum and cakes) and non-alcoholic beverages (later amended to carbonated beverages, bottled waters, vitamin waters and fruit juices). The applications do not claim any priority filing date to the foreign trademark application filed by the Berlin Zoo. For Turtle Pond’s five April 2007 applications, non-final office actions were issued August 6, 2007. Transpo’s pending application was cited at the time as a possible grounds for refusal, so Turtle Pond certainly had notice of Transpo’s application and its earlier filing date before Transpo’s application was published for opposition. On February 14, 2008, the PTO suspended prosecution of these five applications pending the outcome of Transpo’s application noting that because Transpo’s effective filing date was subsequent to Turtle Pond’s filing dates, Transpo’s registration could be grounds for refusing Turtle Pond’s applications on the basis of likelihood of confusion. As for Turtle Pond’s two July 2007 applications, non-final office actions were issued October 3, 2007; however, the Examining Attorney did not cite to Transpo’s then pending application. Both have received final actions, but the necessary changes relate to the identification of goods and not to any substantive refusals to register. While the registration of Transpo’s KNUT mark now raises an issue for Turtle Pond’s five April 2007 application, the only application that is likely to be in serious jeopardy is Turtle Pond’s application for the mark KNUT for stuffed toy animals because Transpo’s registration for the mark KNUT for “stuffed toy bears” and “teddy bears” will certainly be cited as a grounds for refusing registration of Turtle Pond’s KNUT mark under Section 2(d) likelihood of confusion (identical marks, identical goods). It will be interesting to see how far Turtle Pond is willing to go to assert its “legitimate” rights to the name KNUT against this company that got an advantage by being a little faster to file at the PTO. An investigation into Transpo’s “bona fide intent” to use the mark when it originally filed the application as well as its claimed date of first use in commerce (May 15, 2007) may be worthwhile if Turtle Pond desires to file a petition to cancel Transpo’s registration. Of course, the bigger lesson here is that this entire situation could have been avoided had the applications instead been filed by the Berlin Zoo under Section 44(d) of the Lanham Act, 15 U.S.C. §1125(d). Under Section 44(d), foreign applicants can claim a priority date based on an earlier filed foreign application so long as the U.S. application is filed within 6 months from the filing date of the foreign application. Here, the Berlin Zoo could have filed trademark applications as late as September 23, 2007 (after Turtle Pond had received notice of Transpo’s pending application and even after Transpo’s application had been published for opposition) and still received a priority filing date before Transpo’s effective filing date. Wow, either someone at Germany Zoo's side dropped the ball on this one for failure to claim priority or they (German Zoo) must have not cared about the U.S. market very much. Also, it seems Turtle Pond and the German Zoo dropped the ball again by not opposing Transpo's KNUT mark when the opportunity arose since they should have clearly known about it.